For a long time, stickman games have become popular and have been beloved because of creativity and fun. Developed by BYV, The Catapult has impressed many players cause of the brand new things. 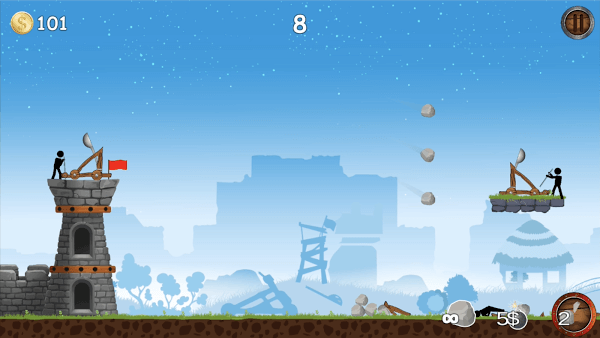 With fun strategy gameplay, excellent graphics, The Catapult for Android is an indescribable entertainment game for everyone. 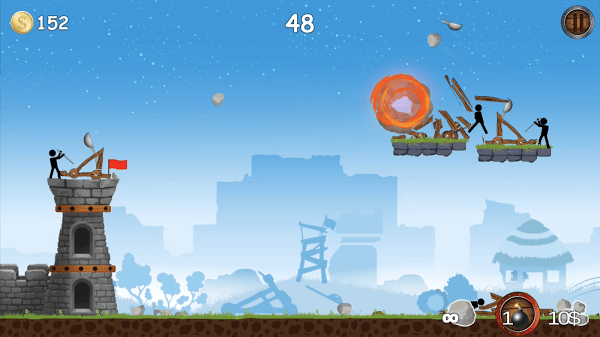 If you’ve played Worms or Angry Birds then it would be very easy to master The Catapult because the gameplay and control of this game are quite similar to those two games. Your weapon is the rubber gun or actually the rock grenades, you have to force the precision and bombard the enemies to protect your own castle. Remember that you have to shoot continuously because the enemy is also attacking you constantly. Try not to let him knock you down first. Each time you win you will be rewarded with gold, you can use this money to buy more advanced items such as ammunition or cluster munitions (creating 3 different bullets in one shot). This is a game not as simple as you think because your opponents are always very good warriors, if you do not fast and careful, they will shoot you down at any time. If you are tired of playing with automatic machines, the two players mode will give you interesting fun moments with friends. Each one on one side and has to protect their own tower by shooting down opponents. The higher the score, the better the winner. If you are a noob because you die constantly, buy a bullet-proof helmet in the shop for a long battle. Remember, there are a lot of things at the store for you. 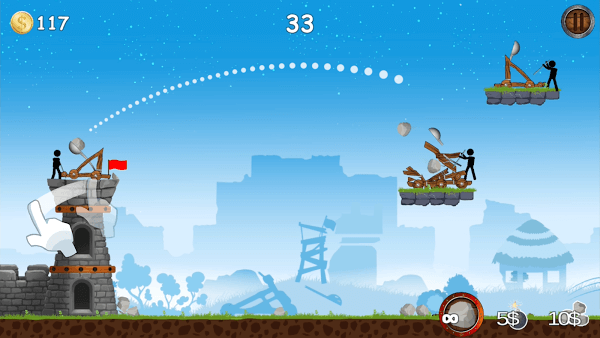 Funny tactical games with the main characters are familiar stickman heroes. No ads during the game. In conclusion, The Catapult MOD is a fun game that we should download and play with friends or entertain themselves after hours of hard work and study. Here we will give you an unlimited gold mod version, so you can buy a lot of free items in the shop. Have fun and do not forget to visit ModDroid.Com every day to get the latest games.